Street and race compounds are available. Select your compound using the buttons above. See the tabs for important information. The easiest brake upgrade you can do. Hawk's HPS brake pad compound will greatly increase the stopping power of your Mustang compared to a stock replacement compound. Light open-tracking: Will last much longer than stock pads, but will overheat and fade sooner than the HP-Plus or race pads. Read the important information on other tabs: Bedding, Safety, Warranty. Hawk's HP-Plus brake compound will greatly increase the stopping power of your Mustang, especially when autocrossed competitively, or open-tracked. Although not a race pad, the temperature rating of the HP-Plus compound makes them suitable for open-tracking. Has good stopping ability when cold. Allows driving your track Mustang to the track, on track, and back home, without changing pads. When open-tracking, the HP-Plus compound lasts much longer than the HPS compound, but will overheat and fade sooner than a race compound. Warning: The aggressive friction material of the HP-Plus compound causes significant noise that most people find unsuitable for frequent street use. Also expect increased dust and greater rotor wear. Much more stopping power than the HPS compound, stopping your Mustang in an even shorter distance. Very high coefficient of friction and very high brake torque when hot. Cold braking bite is slightly less than HPS compound, but the HP-Plus compound is still acceptable for street use. Increased temperature capacity over the HPS pad reduces onset of brake fade. Not for street use; this is a track-only pad. In street use this compound will not come up to temperature, causing poor stopping and extremely rapid rotor wear. We have seen the rotor surface wear down past the gas slots in only 100 miles of street use. Not for street use; this is a track-only pad. For Mustangs that reach high top speeds and experience high deceleration rates during repeated heavy braking, typically with aero enhancements providing significant downforce. When a small reduction in rear initial bite is needed, use DTC-60 rear pads with DTC-70 front pads. Although these pads are burnished by Hawk, they must still be bedded-in to the rotors (new or used) they will be used with. Proper bedding-in of new brake pads causes friction material from the pad to transfer over to the rotor surface. That material transfer maximizes brake performance, and reduces rotor wear, because the pad friction material drags against the transferred friction material rather than the iron rotor surface. After installing new brake pads, make 6-to-10 stops from approximately 30-35 MPH, applying moderate pedal pressure. Make another 2 or 3 hard stops from approximately 40-45 MPH. Do not drag the brakes! Allow at least 15 minutes for the brake system to cool down before applying the brakes again. 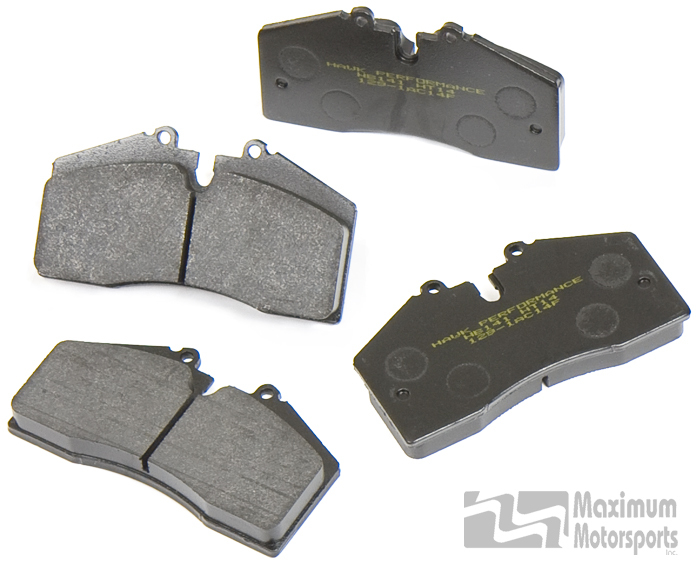 Your new Hawk Performance brake pads are ready for use. Brakes: You need good ones. If you love driving, you need really good ones. Most driving enthusiasts have experienced sudden, intense gratitude for their brakes' stopping power, whether at the end of a quick street straightaway or before carving into their favorite tight turn. But even if you're a mellow driver who just wants to get from home to work without any fuss, all brake pads and rotors experience wear that can lead to poor performance and reduced safety. So they need to be professionally inspected regularly. In some cases, it's also a fine idea to service or replace brake hardware when you get new pads or rotors. Always have a competent mechanic install new brake components, as incorrect installation can lead to major safety problems or even an accident. Then, the fun is gone. To optimize your time behind the wheel, check out the guidelines below and let Maximum Motorsports know how we can help. We're happy to answer any questions to make fun (and safety) a bigger part of your life! Install new brake pads when about 1/8" to 3/16" of friction material remains on the steel backing plate. Install new rotors before their thickness has reached the prescribed "Worn Rotor Minimum Thickness" limit (expressed in millimeters) engraved on the edge of the brake disc. Plain brake rotors can be turned on a brake lathe to remove scoring and true the disc surfaces, as long as they can maintain the minimum thickness. Some brake shops refuse to machine drilled or slotted rotors, so be prepared for that possibility. Your only option may be replacement. Because they're exposed to extremes of heat and pressure, all brake system components (pads, rotors, calipers, lines, hardware, and fluid) must be compatible and should be inspected between race sessions. Brake pads and rotors should be replaced before they reach the wear limits described above. Hawk Performance offers a limited lifetime warranty.